From supplying customized surveillance solutions to law enforcement agencies across the country, to helping VIPs beat the traffic, and continuing to be a leading full-service provider of aerial filming services, Helinet is dedicated to providing an unparalleled quality of service to each of the markets we serve. In addition to Helinet’s dedicated booth N6309, be sure to stop by EuroTec at booth N4330 to see Helinet’s AS 350 B2 featuring a SHOTOVER F1 camera system. 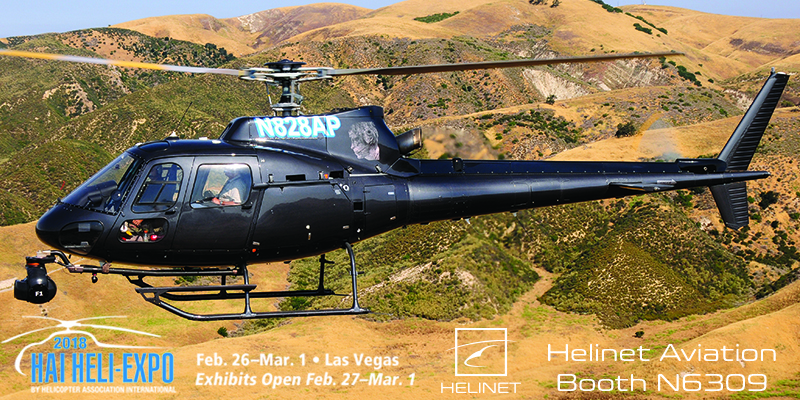 Find out more about Helinet’s Advanced Solutions, Production and Charter divisions, as well as the other services provided by Helinet at HAI HELI-Expo 2018 beginning February 27th – March 1st at the Las Vegas Convention Center in Las Vegas, NV.